3Prof. Dr., Ulucanlar Göz Eğitim ve Araştırma Devlet Hastanesi, Oftalmoloji, Ankara, Türkiye Purpose: We aimed to evaluate the in vivo effects of intravitreal injection of afl ibercept on human corneal endothelial cells in patients with neovascular age-related macular degeneration (AMD). 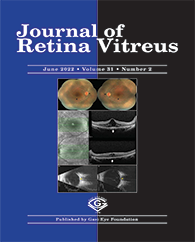 Methods and Materials: Thirty-four eyes of 34 consecutive patients with unilateral neovascular AMD (19 male, 15 female; mean age 66.4±3.4 years) were recruited for the study. All participants received one monthly intravitreal injection of afl ibercept (2.0 mg, 0.05 ml) for three consecutive months, and later treatments were applied as needed. The follow-up period was six months. Noncontact specular microscopy was performed on the central cornea of both eyes at the beginning and during follow-up, including the central corneal thickness (CCT), the endothelial cell density (ECD), the coeffi cient of variation of the cell size (CoV), an objective measure of polymegathism, and the percentage of the hexagonal cells (Hex%), an index of pleomorphism. The nontreated fellow eyes of patients served as the control group. Results: The median number of intravitreal injections per patient was 4 (range, 3-6). The median pre-injection CCT, ECD, CoV, and Hex% was 534.0μm, 2266.0 cells/mm2, 34.5 and 46.0%, respectively. None of these parameters revealed statistically signifi cant difference over six months after intravitreal injection of afl ibercept in either treated and nontreated eyes. There was also no difference in CCT, ECD, CoV, and Hex% between the treated eyes and contralateral nontreated eyes before and during 6-month follow-up.